Researchers work on bringing balance back to the Brush Country. March 2008. Animals flee as an intense fire rages, devouring 95 percent of everything in its path. At Chaparral Wildlife Management Area ("The Chap") the heavy fuel-load of thick brush intensifies the fire’s hunger and spawns a stand-altering blaze. In a press release, TPWD Executive Director Carter Smith responds by telling us: "Obviously, we are concerned about the short term impacts at The Chap from this wildfire, and we should be. But, the bigger story I think is whether these sorts of intense wildfires will be a growing pattern through South Texas." Now, over a year later, the embers have cooled but Smith’s words still linger, leaving us to ponder this "bigger story." In particular, we wonder how South Texas’ birds, some of the littlest wildlife, would fare in the face of more big fires like this one. In order to understand the possible effects on the region’s winged creatures, we must first understand how they’ve already been affected by habitat changes. You see, both this bigger story and its bird tale begin with sheep. It is said that Sierra Club founder John Muir likened sheep to "hooved locusts who kill more than they eat." This is especially true if there are too many in a place that cannot sustain them all. Such was the case in South Texas in the late 1800s when more than 2 million sheep grazed the region. As the perpetually starved animals consumed every grass and forb in their path, their sharp hooves cut out the roots so that vegetation was killed for years to come. 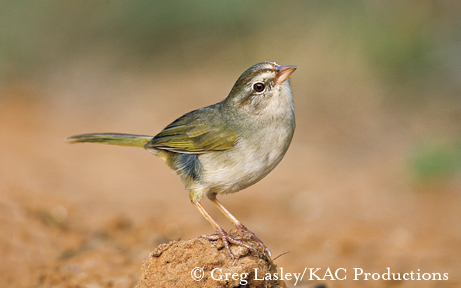 Much of the habitat grassland bird species called home was also destroyed in the process. Next on our list of leading characters in our bird tale are cattle. Once the sheep experiment went terribly awry and the grasses became less abundant, ranchers increasingly turned to cattle, animals that are both grazers and browsers. As cattle browsed, it became apparent that the bovine’s favorite snack was the sweet bean of the honey mesquite. Soon, the South Texas native earned the nickname "The Money Plant" because it both fed and fattened. However, what was good for business was unfortunate for grassland birds; when it came to the bean, part of what went in the steer also came out. The habitat alteration that began in earnest with the voraciousness of the sheep continued with the prolific mesquite seed-dissemination of the cattle. Enter our third character: fire. As settlers continued establishing a vested interest in the region, it became important to protect those interests from burning. Nature’s quicker and cooler fires, the kind with lower fuel-loads, the kind that unlock dormant native grass seeds and set them free, became a distant memory. Flames were no longer allowed to quicken and the centuries-old procreation cycles of native grasses were short-circuited. At the same time, nature’s method of brush control was thwarted. Today, while the sheep are mostly gone and, according to Leonard Brennan of the Center for Quail Research in Kingsville, many ranchers have reduced cattle grazing pressure, man is still suppressing fire. So far our bird tale has taken us from too many sheep destroying too much grass, to too many cattle planting too much mesquite, to too little burning going on. It’s led us smack dab to where we are today which, according to Smith, is: "The tremendous amount of brush that we now see in South Texas was not historically present there, but has built up over time as a result of overgrazing, changing land use patterns, and suppression of fire." What was historically present there? While early accounts often conflict, most likely yesterday’s Brush Country was a healthy mix of brush mottes with patches of native grasses. One account describes its pre-European settlement state as a prairie with grass as high as a man on horseback. However, this part of our tale is probably taller than the grass and has grown with the telling. The truth is that many historians agree that what early European settlers, who often had no other basis of comparison, were calling prairies were really interspersed grassy areas of 50-100 acres (with man-on-horseback-high grass in very wet, very rare years). Cliff Shackelford, TPWD nongame ornithologist, says that while the mix between brush and grass wasn’t necessarily even, "there was certainly a lot more native grass than we have now. It’s also a safe bet that the brush didn’t blanket the large areas that it does today. Fire kept the woody species from spreading. Since modern humans have suppressed fire, and some have almost eliminated fire, the woody species have spread north." And, while no one is comfortable saying for sure exactly who the area’s frequent fliers were before sheep, cattle and man’s vested interests changed the habitat, they will say there was more diversity. Most agree that there were more grassland species and fewer brushland species of birds than there are today, especially the further northward in the Brush Country you go. As the woody plant species have moved north, Shackelford says, so have the birds that need woody brush cover like the long-billed thrasher, olive sparrow and green jay. "Species that like mesquite, huisache, retama, and dozens of other scrub species are inching northward thanks to fire suppression," he says. "What’s in short supply after fire suppression are larger grasslands or savannahs where so many grassland birds abound, including more than a dozen overwintering grassland species." Tom Langschied, coordinator of the South Texas Wintering Birds Program in Kingsville, has also noticed these trends. "We’ve seen a big expansion of brushland birds such as Harris’s hawk, white-tipped dove, great kiskadee, green jay, long-billed thrasher and the Audubon oriole," Langschied says. "This is because the brush has become like a bridge that allows the birds to travel further north than they used to be able to. 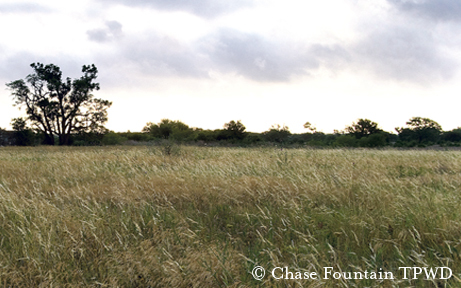 There’s always been a brush component to South Texas, but as brush has become more abundant, the cover is giving brushland birds more mobility." These days, the historical proportion between grassland and brushland species is long gone. But, with more fires like the one at The Chap, the proportion we’re seeing today could become more balanced. "It’s hard to say what things would be like Shackelford points out the benefits. "I’m a big fan of fire and what it does for birds," he says. "More frequent cool-burning fires would maintain a healthy grass cover that would keep woody species from encroaching and dominating after shading out the grasses." Already, says Langschied, birds such as loggerhead shrikes, American kestrels and whitetail hawks are doing better at The Chap since its fire. "Ranchers call whitetail hawks ‘fire hawks’ because they do so well after a fire," he explains. "This bird has developed around fire, around open country. He’s uniquely adapted to take advantage of it." David Synatzske, manager of The Chap, says fire is also beneficial for quail. "In the long run the quail will do better because the fire thinned things out," he says. "They don’t like it much when the brush gets too thick and do better when it’s a good mix of nesting cover and brush." Brennan agrees, and says that when conditions get too thick, "some form of disturbance is needed to reset [them] back to a point where they are favorable for quail." While mourning dove currently flourish in South Texas, they would be expected to do even better with more fire. "I think that the fire itself created a habitat that we haven’t had in a long time," Synatzske says. "Now the dove will be able to find the seeds that had been covered up by other vegetation. Immediately after the fire there were easy pickings." However, there’s another side to the story. 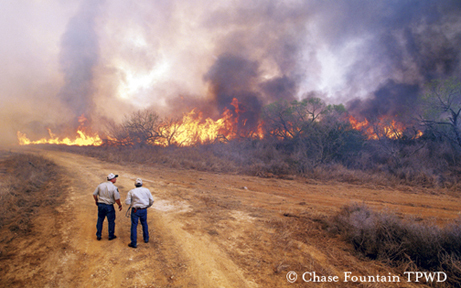 More fires in South Texas would likely have a negative effect on the brush-loving species that have been reaping benefits from fire suppression. Langschied considers the Audubon oriole, which "has been on a consistent northward roll," as "one of our best indicator species of how fire in the area would affect brush birds." Langschied is one of the researchers taking part in a joint study between Texas A&M University—Kingsville and the Texas Parks and Wildlife Department. The study has just begun to take a closer look at how the March 2008 fire affected the birds at The Chap. "I’m particularly going to be watching what’s going on with the Audubon oriole," Langschied says. "This bird has had some of the highest counts at The Chap of anywhere in South Texas in previous Christmas bird counts. Because this bird needs some brush for cover and nesting, the Audubon oriole could almost be the poster child in terms of how fire affects brush birds." Brent Ortego, TPWD wildlife diversity biologist, notes the effects of the reduced density of woody vegetation due to the Chap fire. "You would speculate that species which prefer dense woody vegetation like black-crested titmouse, Bewick’s wren, long-billed thrasher, olive sparrow and northern cardinal would be hurt by the fire in the short term, and species like mourning dove, Cassin’s sparrow, black-throated sparrow, and pyrrhuloxia would benefit." Ortego is careful to use the word speculate because, in our bird-tale portion of the "bigger story," nothing’s simple. There’s yet another set of variables to consider: The ghost of past grazing practices has left the footprint of non-native grasses on the region. "Unfortunately, a lot of times after fire, what comes back are non-native, or exotic, grasses instead of natives," explains Langschied. "If fire goes through and all of a sudden these invasive grasses become more dominant — you know these grasses that were planted to ‘improve the rangeland’ — if these take hold instead of the natives, then that could affect diversity." "Exotics tend to dominate and take over," he adds, "resulting in the sort of homogeneity that doesn’t provide the variety needed to sustain a good variety of grassland birds." So, as our tale comes to an end, just how does it end? How would more fires in South Texas affect birds? What we do know is that more fires would probably increase diversity by creating a better balance between grassy and brushy areas. We also know that more prescribed fires would be the best way to achieve this, rather than more intense, stand-altering fires like the one at The Chap last year. Beyond that, we know little for sure when it comes to South Texas birds and fire. That’s why, says Ortego, researchers are looking to the upcoming study to provide more information and help them "develop a defensible hypothesis." Thus, as we bring this portion of the bigger story to a close, it appears that much of it still remains to be told.